Nothing makes a statement more than a beautiful Solid timber Boardroom table.I make them to special size and designs to suit each of my clients needs. This one is Jarrah made to specification 3600 x 1200mm and includes a rebate in the solid timber allowing for the inserted 10mm of shaped glass.There was almost a days work in etching the top out to make way for the glass.The slight curvature to the tables edge allows those attending the meeting to look at each other down the length of the table which looks great and facilitates function.Delivery of this table to the clients upstairs boardroom via the staircase was another story in itself. (Thanks to the 12 blokes who helped out!!) 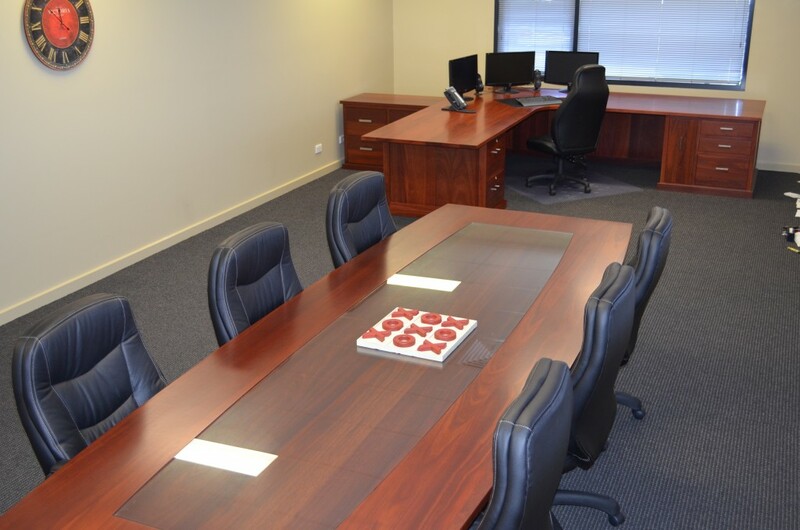 Over the years I have completed boardroom tables for various companies and I can make them for you in timbers including Jarrah, Redgum, Messmate, Ash, American Oak, Spotted gum and other timbers on request. If your looking for a high quality solid timber boardroom table get in touch so I can propose a solution for your office.